Sediment fingerprinting has been used successfully to identify land uses that are the major sources of sediment. This study will apply these techniques in a predominantly rural, volcanic landscape. 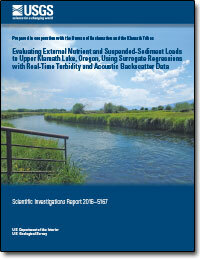 The USGS employs state-of-the-science techniques to estimate nutrient and suspended-sediment loads to Upper Klamath Lake. 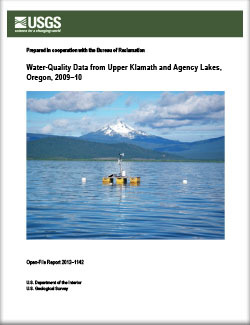 The USGS has characterized nutrient concentrations in the Klamath River and Lost River drainages over multiple years, identified spatial and temporal patterns in nutrient and organic carbon concentrations, and quantified surface water nutrient loads entering and exiting the Klamath Project. 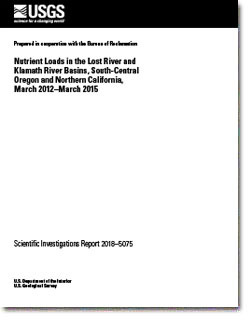 Schenk, Liam N.; Stewart, Marc A.; Caldwell Eldridge, Sara L.
Schenk, L.N., Stewart, M.A., and Eldridge, S.L.C., 2018, Nutrient loads in the Lost River and Klamath River Basins, south-central Oregon and northern California, March 2012–March 2015: U.S. Geological Survey Scientific Investigations Report 2018-5075, 55 p., https://doi.org/10.3133/sir20185075. Schenk, Liam N.; Anderson, Chauncey W.; Diaz, Paul; Stewart, Marc A.
Schenk, L.N., Anderson, C.W., Diaz, Paul, and Stewart, M.A., 2016, Evaluating external nutrient and suspended-sediment loads to Upper Klamath Lake, Oregon, using surrogate regressions with real-time turbidity and acoustic backscatter data: U.S. Geological Survey Scientific Investigations Report 2016–5167, 46 p., https://doi.org/10.3133/sir20165167. 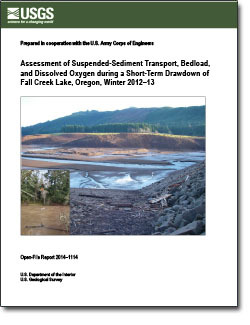 Schenk, Liam N.; Bragg, Heather M.
Assessment of suspended-sediment transport, bedload, and dissolved oxygen during a short-term drawdown of Fall Creek Lake, Oregon, winter 2012-13; 2014; OFR; 2014-1114; Schenk, Liam N.; Bragg, Heather M.
Eldridge, D. Blake; Caldwell Eldridge, Sara L.; Schenk, Liam N.; Tanner, Dwight Q.; Wood, Tamara M.
Water-quality data from Upper Klamath and Agency Lakes, Oregon, 2009-10; 2012; OFR; 2012-1142; Eldridge, D. Blake; Caldwell Eldridge, Sara L.; Schenk, Liam N.; Tanner, Dwight Q.; Wood, Tamara M.